Lotto Texas as you know has changed in configuration. The First drawing was held on Wednesday, May 7, 2003. To now play Lotto Texas you select five (5) regular numbers from a field of 1 to 44 and one (1) Bonus Ball number from 1 to 44. Five (5) white balls are drawn from a field of 44, and then one (1) blue bonus ball is drawn from a field of 44. When what we consider sufficient draw results are available that provide usable statistics since the Lotto Texas configuration change became effective, The GENERATOR will provide all the results for the draws in the new configuration. In the meantime as a courtesy to players, The GENERATOR will continue to provide the statistics and draw results available prior to the configuration change. Instructions are provided to assist you from the very first time you start The Generator. In the trial period a blinking prompt, "Launch quick start guide", will always be displayed. All first time users are advised to click on this prompt that immediately launches the Quick Start guide for you to view the valuable startup instructions on how to use The Generator. Free unlimited lifetime program updates immediately available whenever issued. Includes a base of major United States, Canadian and International lotteries. Lotteries will always be added based on demand. Subscription up to Date Winning Draw history results for all the major United States, Canadian and International lotteries supported by The Generator. Determines the current success trend probability of numbers using strict time phased analysis of statistics from the used history of each lottery's winning draw numbers. Each lottery's numbers are placed into one of seven different RANKS sets of numbers (RANKS 0 to 6). Numbers in each RANK have a similar possibility of being drawn but The Generator can reveal from statistics which number in each rank is more likely to be successfully drawn based on how many draws have gone by since each number was last drawn. 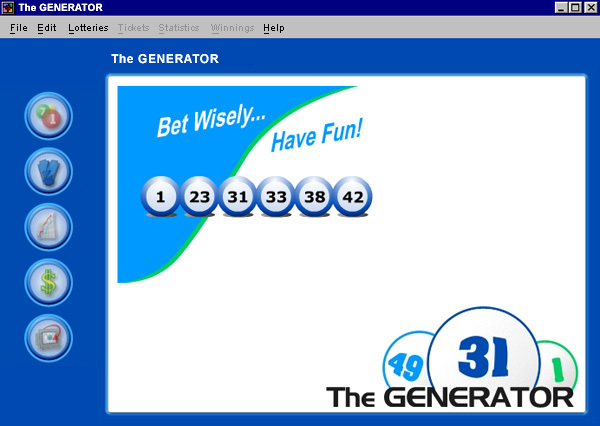 The Generator further assigns a best to last "Draw Position" to each lottery ball. "Online Help" in the application and "Documentation" from www.lotterygenerator.com details for you how to understand and use the statistics assembled for each lottery. Three sets of numbers are selected for you from each lottery's ball set to choose from: (a) An Initial Qualifying Selection (IQS) set, (b) a Rank Suggested Set (RSS) chosen from the IQS, (c) All other numbers that statistically fail to be IQS selected. Important Note: In most 6/49 lotteries, the odds of winning are 1 in 13,983,816. The Generator's winning odds from the IQS is 1 in 475,020 and from the RSS is 1 in 38,760 when the Lottery's current statistics patterns hold true. The Generator dramatically improves your odds of winning and allows you to confidently play without guessing. A history of each Lottery's winning draw numbers is always available for review. Automatically check your played tickets for winning numbers. Record your winnings by lottery for review by lottery and total won. Players assemble their own play tickets from their own selected number set with the assistance of the vital statistics available. Use any of these sets and have The Generator pick your play tickets simulating the way numbers are drawn and using intelligent random generation methods. From the Help drop down menu select "Play the movie" to always get six randomly generated numbers selected for you. Setup, play and fully manage your own lottery, (add, change, delete draw results or the lottery itself), if your lottery is currently unsupported by The Generator. (Note: It is recommend that you first have at least a history of the last the 21 draws entered to be able to be used for statistical analysis before playing your own lottery). 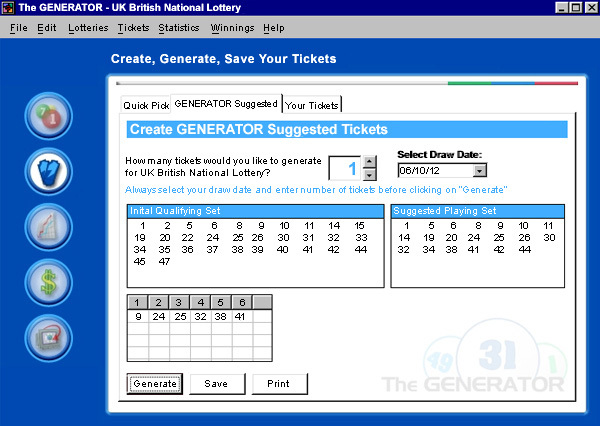 Supplied lotteries can be updated with draw results. All other functions for these are Generator controlled. Always the latest Online Help available for all players.